Those were the best houses. I remember one that had a fog machine, eerie music, green lighting, and a dark figure on the porch eating what appeared to be a severed leg. I was the bravest of the group, so naturally I approached first, and the thrill of fear mixed with the excitement of the Halloween spirit as I made my way around the grave-infested lawn. So, this Halloween, don’t be a party pooper: turn your house into a haunted house! It’s easy, and if you do it right, it’s not all that expensive. The first and most obvious thing you need is a cheap pack of fake spiderwebs, which might run you around $3 (you big spender, you). Stretch these to the max around bushes, fences, trees—get creative. If you don’t have any, stretch it around furniture, lamps, or pretty much anything outdoors or indoors that you can hook it onto. For a nice effect, throw some plastic spiders on the web. If you’ve got a lawn of any kind, you’re going to need headstones. You can pick up the styrofoam kind for as little as $4 at a Walgreens or a Halloween store. Or, if you’re really crafty and want some high-quality graves, you can make your own. To go with the tombstones, you can also find “zombie emerging from the ground” kits at your local Halloween store. After these basics, there’s a ton of possible props you can add. Stuff some old clothes (preferrably flannel) with newspaper or straw to create your own scarecrow. Get one of those giant inflatable decorations. Craft some chicken wire into some awesome life-sized poseable ghosts. Or you can do what these people did just down the street from me, and go totally overboard with skeletons, bloody machetes, and more skeletons. Complete the look with some spooky signs that warn of the dangers that lay ahead. If you’re really into special effects, set up speakers to play creepy music or sound effects, and have a fog machine puffing mist out over your scene of nightmares. Some people get super serious with their Halloween props. To these, I suggest hitting up a Spirit Halloween store; their merchandise is unbelievable. They’ve got life-sized vampires sitting up in their coffins, lurching zombies, animatronic Frankensteins, and more. When dusk strikes, it would be nice if people could still see these lovely decorations you’ve put up, so you’ll want to add some lights. These can be anything from jack-o-lanterns on the porch and solar-powered skull stakes that line the walkway to pumpkin- or ghost-shaped string lights. If you don’t have a house with a lawn, never fear! 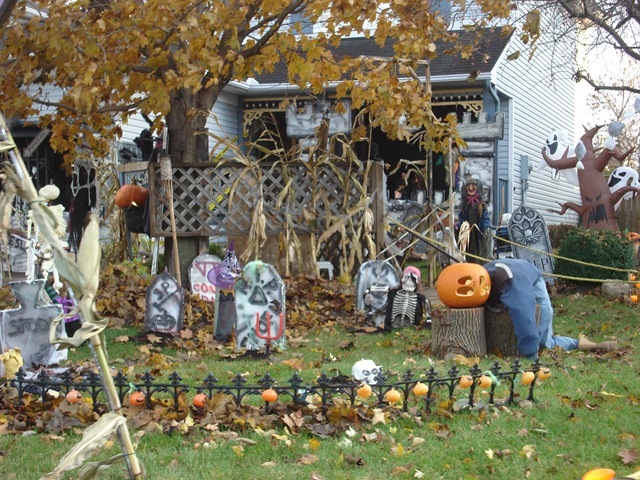 Apartment-dwellers can hang window decorations complete with macabre scenes, and those in dorms can festoon their walls with Halloween garland and cardboard cutouts. 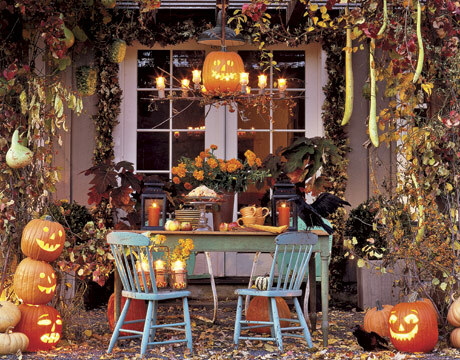 There are tons of indoor decorations to satiate your desire for a festive living-space (I even have my pumpkin string lights wound around the curtain rod in my bedroom), so you have no excuse not to engage in the holiday and create an autumn wonderland. 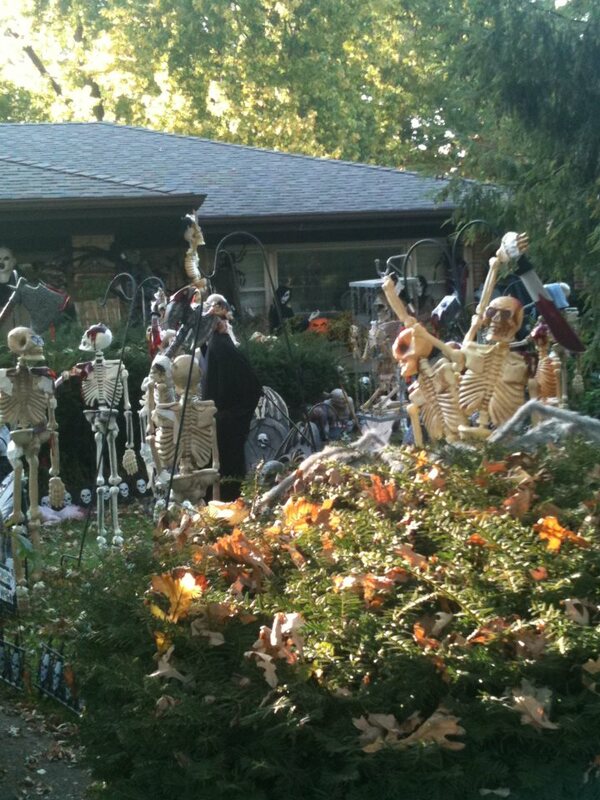 Now: go forth and decorate the town with the most gruesome and gothic props your eyes have ever beheld.